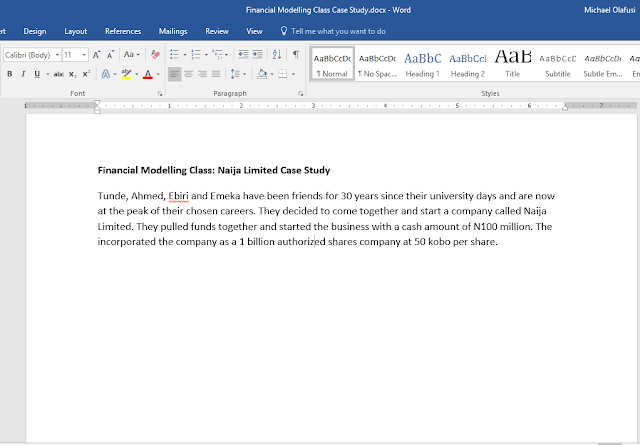 A couple of months ago, I announced that I was working on developing a financial modelling course that we will be running constantly (maybe every 3 months) like the Microsoft Excel and Business Data Analysis course we run monthly. Well, now I can tell you that I am making good progress. For now, what we do is handle financial modelling training for companies and build financial models as a consulting project for clients. I have been very slow in developing a Nigerianized manual and case studies for the financial modelling class, which is what I want to use for the planned monthly/quarterly financial modelling class I want to set-up. You have already seen some of the content for the manual, as they are what I published as blog posts a few weeks ago. I have reviewed and expanded them for the training manual (still in progress). I am also building a case study that will be the major practice for the class. A fictitious Nigerian company started by four long-term friends who have gotten to the peak of their chosen career and decided to start a big company together. The case study will walk the participants through the fundamentals of what assets, liabilities and owner's equity are; through how to create a journal; through how to create T-accounts; through how to create a general ledger; through adjusting journal/ledger entries for the trial balance that will be used to create the financial statements; and finally, guide them through creating Income Statement, Balance Sheet, Cash Flow Statement and DCF Financial Model/Valuation. It is a very interesting and easy to relate with case study. I already have a class to take this August (last week of August). So I need to complete all my materials and case study this month. I am already on page 11 for the main material and page 1 for the case study.